Most things I cook are made from scratch, this however, is not one of them. This is one of the easiest desserts to make, it is just getting a few store bought ingredients and mixing them together. My aunt, Teta Anka, used to make this at nearly every family gathering we ever had growing up. It was so popular with our family, we all looked forward to it. She would make a huge batch of this and if any was leftover, my mother would always want to take some home for tomorrow, it was one of her favourites. It has been over 15 years since I last had this. I found the recipe this morning and decided I'd make it. This is something that is great for parties, it is light and refreshing. When you first see it you expect it to be really sweet, it is actually not, it has a tartness about it also. The sweetness of the marshmallows is countered by the sour cream. 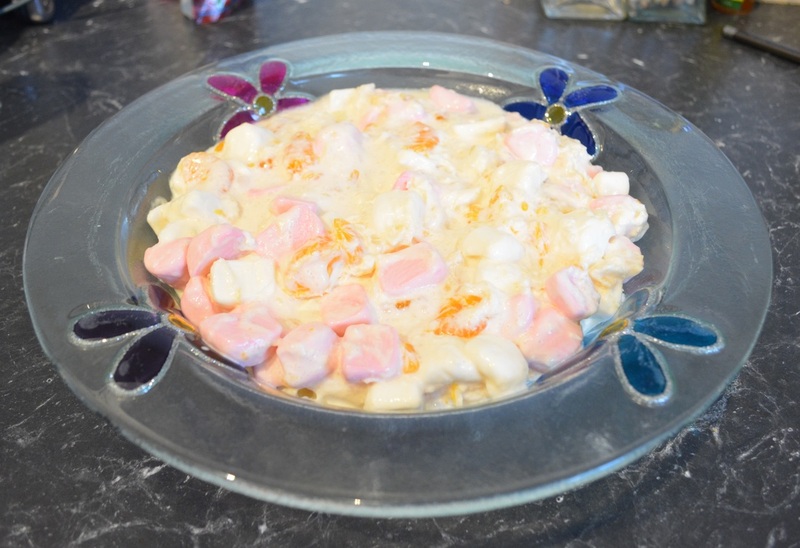 This is a recipe from my families party food history, hope it becomes yours to.. 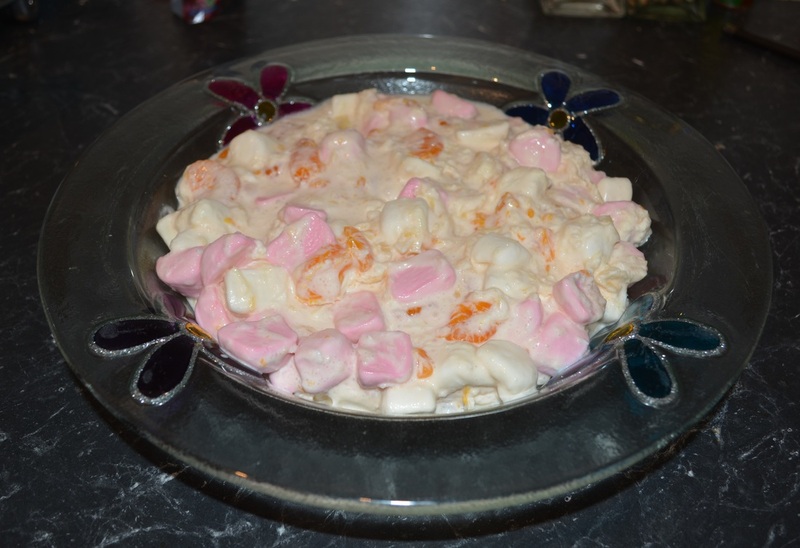 Using scissors, cut the marshmallows in half and place in a large bowl. Drain mandarin segments, reserve the juice of one tin. Drain the crushed pineapple, reserve half of the juice. To the marshmallows add the mandarin segments and reserved mandarin juice, the crushed pineapple and reserved pineapple juice and the sour cream. Stir well to combine. Add the coconut if you are using it. If the mixture is too runny, add some dried breadcrumbs a little at a time, until you have the thickness you like, don't add too much though. Refrigerate until need, best served cold.